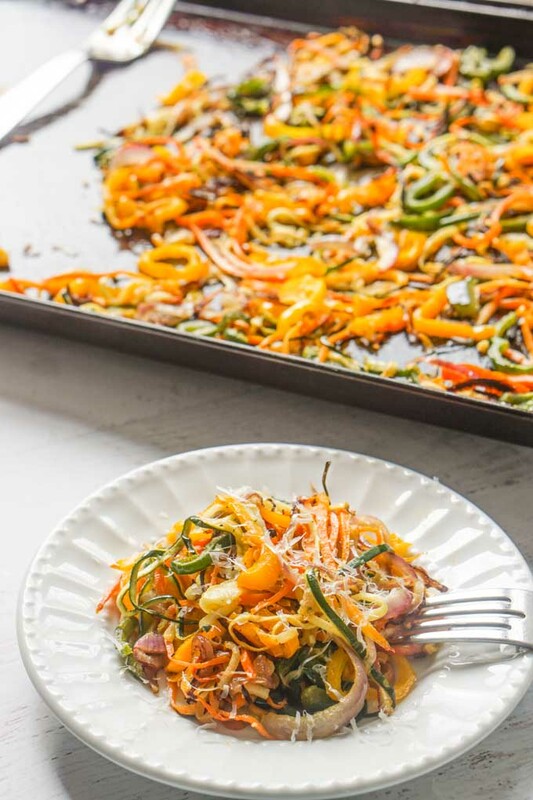 Easy Roasted Veggie Noodles - a healthy vegetable pasta recipe! 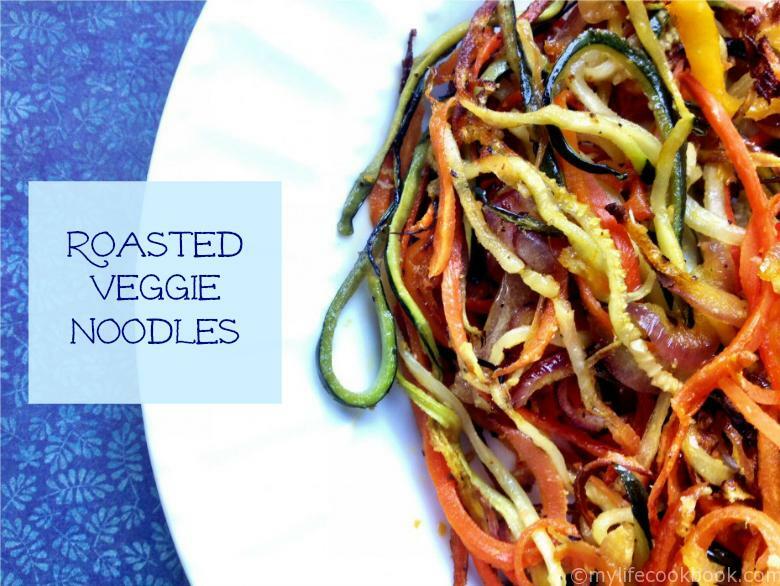 Try these roasted veggie noodles for a delicious and healthy side dish or just to use up all those vegetables from your garden. So simple but tastes great. You might also like this cheesy broccoli cauliflower rice! 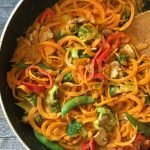 When I first saw veggie noodle recipes on Pinterest just the colors got me excited. 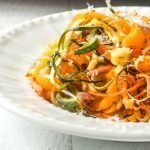 I really do love vegetables and am always looking for new ways to prepare them. You would be surprised at how the cut of the vegetable impacts the taste. That is why I use my sprializer so much. 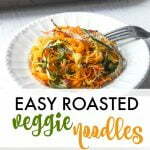 It makes vegetable noodles quick and easy. 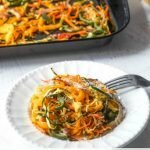 These roasted veggie noodles make a great side dish and it’s a good way to use all those vegetables that are in your refrigerator or garden. 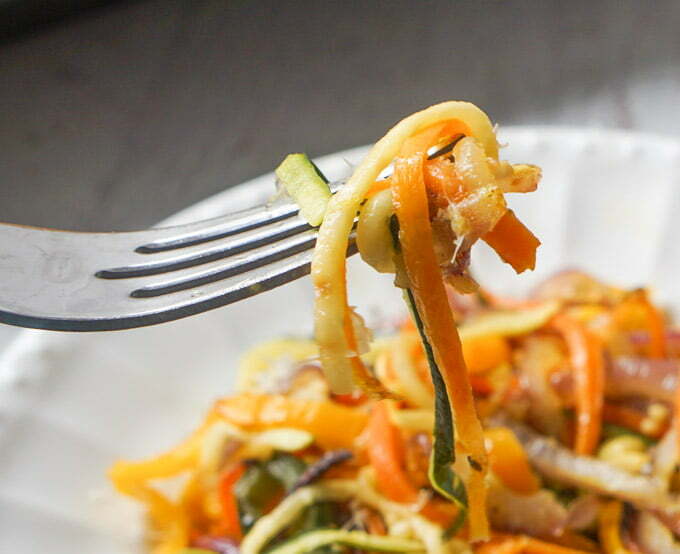 Vegetable noodles are just noodles that you cut to look like pasta. Does it taste like real pasta, no. Does it taste good? Absolutely! It all depends on how you prepare them and even how you cut them. The cut of the vegetables can really change the taste of them. 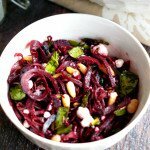 There are so many spiralizers out there on the market, how do you know which one to use? Well I have 3 and I use them for different types of noodles. As you can see below I have cut some zucchini with my 3 spiralizers and a regular potato peeler. This is what the noodles look like. 1) Saladacco spiral slicer – this particular one makes very thin angel hair type noodles. It’s my oldest one but I like it for turnip noodles. 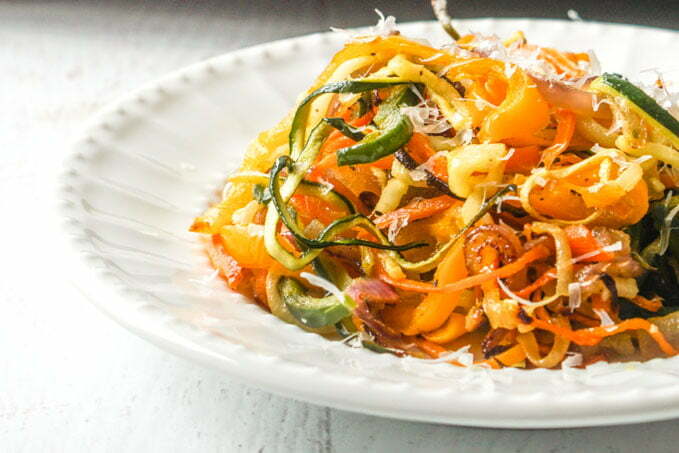 2) julienne peeler – these vegetable noodles are what I mainly used in this recipe. It’s convenient because it’s handheld and it make nice, sturdy but thin noodles. 3) Paderno spiralizer – this one makes a few different sizes of vegetable noodles. It’s big and a bit bulky but it makes great thick fettuccini noodles in minutes. 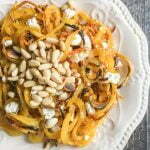 I like it for my butternut squash noodles. 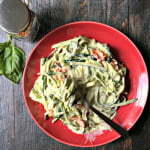 4) standard vegetable peeler – I like to use this one for wide zucchini noodles. I have really been enjoying these noodles lately. 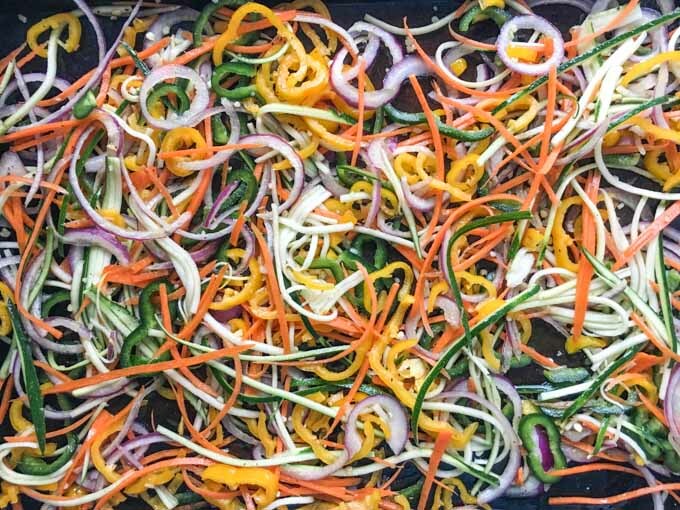 Raw vegetable noodles waiting to be roasted. The recipe is pretty straight forward. I used carrots, zucchini, peppers and red onions along with my julienne peeler. You can see above how pretty they look raw. To roast the noodles, first tossed them in olive oil, garlic, salt and pepper. 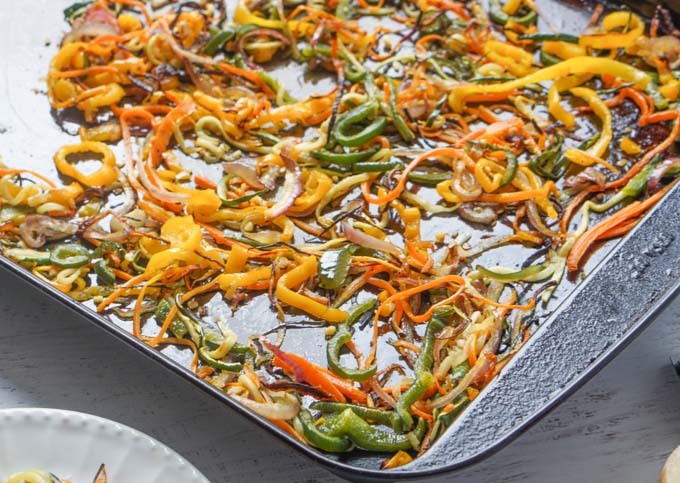 Spread them on a cookie sheet and roast for 20 minutes in a 400 degree oven. You might want to check them around 15 minutes to make sure they don’t burn. That’s all there is to it. You can top with fresh grated cheese if you wish. Not only was this dish beautiful to look at, it tasted great too. I plan on making this recipe and a few variations of it much more in the future … especially in summer when I can use my own veggies from the garden. The next time I think I am going to use some of the Thai curry pastes I just bought. I think that the veggies along with some ground chicken, coconut milk and the curry pastes would be an excellent combination. Check back soon to see that. 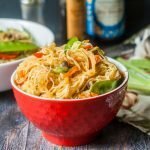 A few of the many veggie noodle posts! 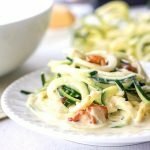 This recipe was adapted from Peace, Love and Low Carb.com. 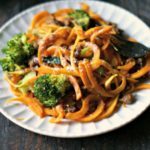 Check out her other wonderful low carb recipes! 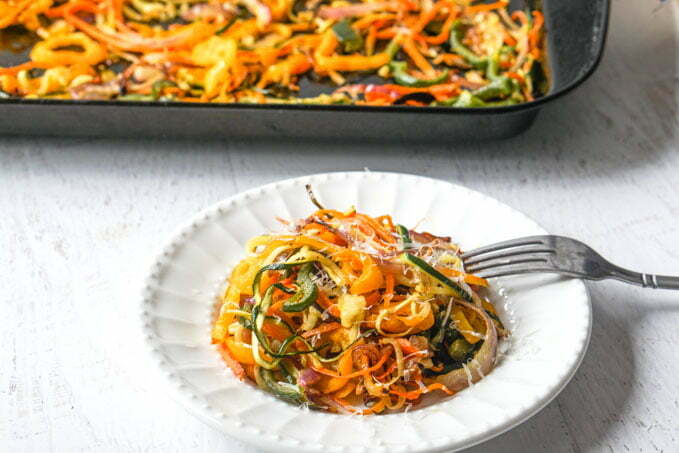 Try this roasted veggie noodles for a delicious and healthy side dish or just to use up all those veggies from your garden. So simple but tastes great. 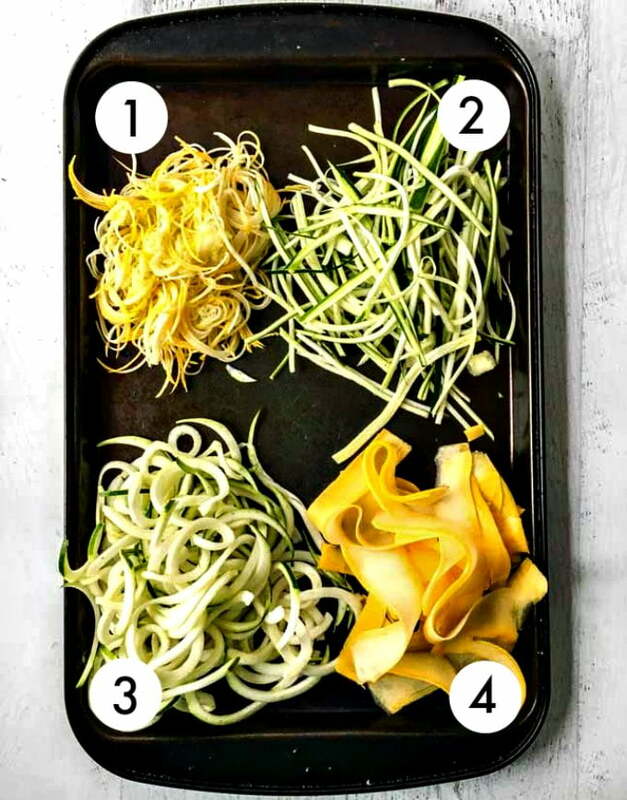 Use a spiralizer, mandolin or a julienne peeler to make your veggie noodles. 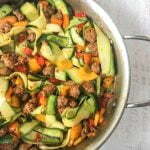 I used my julienne peeler on the carrot and zucchini and my mandolin on the onion and peppers. You can use any veggies you like but this is what I had on hand. In a bowl combine veggies, oil, garlic and seasonings. Spread out on a greased cookie tray and roast for 20 minutes. Check half way and flip veggies if needed. Enjoy! 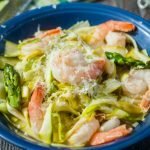 Previous Post: « Low Carb Mac & Cheese with Shrimp – gluten free version without pasta! The overhead picture of the veggie noodles is just beautiful. My wife has talent! WOW! What a delicious and beautiful recipe! Thanks Kushi! It’s an oldie but goodie! Just saw this on my Yummly app and they look wonderful! I am definitely going to try this! Thanks Cheri! I really liked them….they are simple but tasty.